“If this is street food, I want to live on that street,” says my husband as we depart Bindaas. We’re giddy after a memorable meal, and probably the after-effects of “Green with Envy” cocktails. Bindaas, which is Hindi slang for cool and carefree, features a menu showcasing Indian street food. 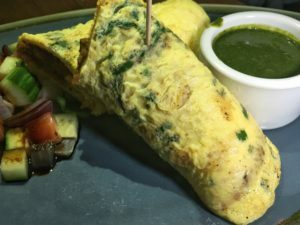 DC restaurateur Ashok Bajaj and James Beard award-winning chef Vikram Sundaram ( Rasika and Rasika West End) dazzle diners by transforming traditional Indian ingredients into contemporary palate pleasers. 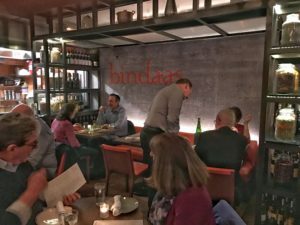 Bindaas opened last August in the Cleveland Park neighborhood of DC, taking over the space that was previously the Bardeo in Ardeo/Bardeo. The menu opens with a selection of chaat savory snacks. Masala popcorn sprinkled with coriander, cumin, and curry leaf has us exclaiming “holy crap” at the get-go. We munch on the addictive snack as we peruse the menu. Vegetarian and pescatarian dishes are plentiful at Bindaas, which prolongs decision-making for my husband. He’s not accustomed to such an expansive array of options. Shisito peppers are deep fried, filled with potatoes and rice, and accompanied by pickled onion chutney. If you don’t mind the element of surprise – some are spicy, some not- these are not only delicious, but fun. 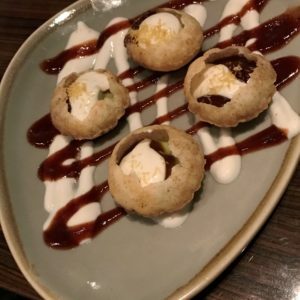 Conduct a Google search for Bindaas and even though the restaurant is relatively new, you’re bound to see numerous raves about avocado golgappa. These are light and airy puffed biscuits, infused with sweet yogurt and tamarind chutney. We are startled by the depth of flavor packed into the delicate orbs. Our server checks in, and is tickled by our unabashed delight. It’s tempting to linger in the chaat section, but uttapam lies ahead. 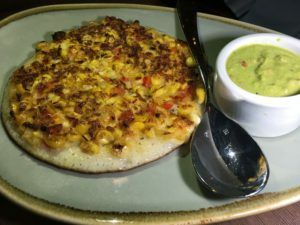 Rice pancakes studded with charred corn and red pepper are swiped into a pool of thick avocado sauce. It’s a marvelous next step. Kathi rolls- an Indian version of a wrap – envelop pork, chicken, or lamb. Lamb kathi rolls are an assemblage of lamb, onion, and egg which take an eye-popping turn when dipped in the spicy chutney. 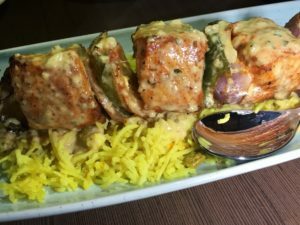 Chili salmon shashlik is more subtle in flavor, but its quiet complexity is appreciated amidst the steady stream of bolder flavors. Prices at Bindaas offer a reprieve from the usual range at downtown DC restaurants. Popcorn and naan at $2.50 is almost hard to believe, while most other dishes range from $6 to $14. Seven dishes for two people is more than enough, but a few leftovers for lunch the next day is cause for celebration. The only quibble is the challenge that often accompanies a small plates menu. Dishes are delivered as they’re ready, and ours come out in rapid succession. I prefer more breathing room, so I can savor every bite. A visit to Bindaas drives my first resolution of 2017- a pledge to return to the restaurant ASAP. And unlike that resolution to exercise more, this is one I’m sticking with.